The team surgically implanted the sugar powered device in the abdominal cavity of two rats. The maximum power of the device was 6.5 microwatts, which approaches the 10 microwatts required by pacemakers. They calculated they obtained a maximum specific power of 24.4 microwatts per milliliter, which exceeds a pacemaker’s requirement of 10 microwatts. The technology could be used for a range of applications, such as neural and bone-growth stimulators, drug delivery devices, insulin pumps, and biosensors, says Eileen Yu, a chemical engineer at Newcastle University. But whether enzymes remain stable for a long period of time is a concern, she says. And the efficiency of transfer of electrons between enzymes and electrodes should be improved. Cinquin believes his team can improve its efficiency. “I’m optimistic that we will get tens of milliwatts in future versions,” he says. They hope to see them developed for use in humans within five to 10 years. Keith Henson noted that the burning of excess sugar (calories) could help solve obesity and increased power could be used for devices like cellphones or implanted computers. Powering future generations of implanted medical devices currently requires cumbersome transcutaneous energy transfer or harvesting energy from the human body. No functional solution that harvests power from the body is currently available, despite attempts to use the Seebeck thermoelectric effect, vibrations or body movements. Glucose fuel cells appear more promising, since they produce electrical energy from glucose and dioxygen, two substrates present in physiological fluids. The most powerful ones, Glucose BioFuel Cells (GBFCs), are based on enzymes electrically wired by redox mediators. However, GBFCs cannot be implanted in animals, mainly because the enzymes they rely on either require low pH or are inhibited by chloride or urate anions, present in the Extra Cellular Fluid (ECF). 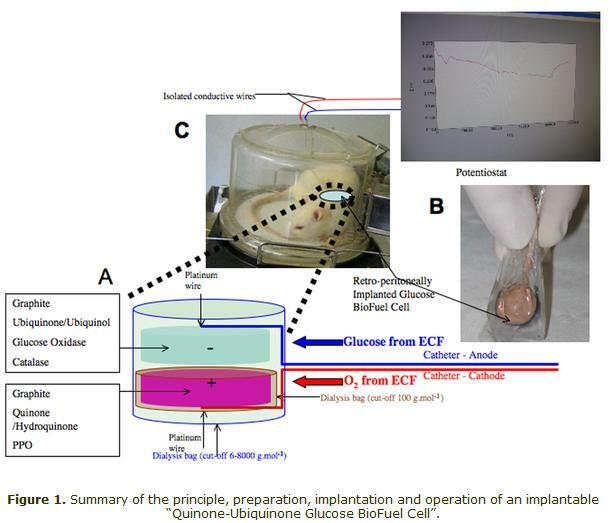 Here we present the first functional implantable GBFC, working in the retroperitoneal space of freely moving rats. The breakthrough relies on the design of a new family of GBFCs, characterized by an innovative and simple mechanical confinement of various enzymes and redox mediators: enzymes are no longer covalently bound to the surface of the electron collectors, which enables use of a wide variety of enzymes and redox mediators, augments the quantity of active enzymes, and simplifies GBFC construction. Our most efficient GBFC was based on composite graphite discs containing glucose oxidase and ubiquinone at the anode, polyphenol oxidase (PPO) and quinone at the cathode. PPO reduces dioxygen into water, at pH 7 and in the presence of chloride ions and urates at physiological concentrations. This GBFC, with electrodes of 0.133 mL, produced a peak specific power of 24.4 µW mL−1, which is better than pacemakers’ requirements and paves the way for the development of a new generation of implantable artificial organs, covering a wide range of medical applications.